Little Red Sleeps Up To 4 People And Up To 2 Dogs Are Ok. Large Bathroom. Our Little Red Cabin is nestled in Paradise Estates just 5 miles from the Paradise Entrance to Mt. Rainier National Park. The physical address is 280 Osborn Road, Ashford, WA. The cabin will sleep 3-4 people and has a queen size bed in an upper loft as well as a futon on the main floor. Bedding is provided. The kitchen is well-stocked with dishes and utensils, has a microwave, a small 4-burner stove and a dorm-sized refrigerator.. It also has a coffee pot, coffee bean grinder and an electric tea-pot; perfect for sipping your favorite beverage while sitting out on the deck. The nice-sized 3/4 bathroom has a shower and towels are provided. There is an outdoor fire pit and a charcoal grill; bring your own supplies for them! Come and enjoy the cozy charm of Little Red. Peggy & Andy live in Ashford and look forward to meeting you upon your arrival. They fell so in love with this area they decided to make Ashford their permanent residence after living in the Snoqualmie Valley area of Washington for years. Something fun to know is that Peggy is an avid Volunteer in Mt. Rainier and welcomes offering suggestions for trails, places to visit and more! 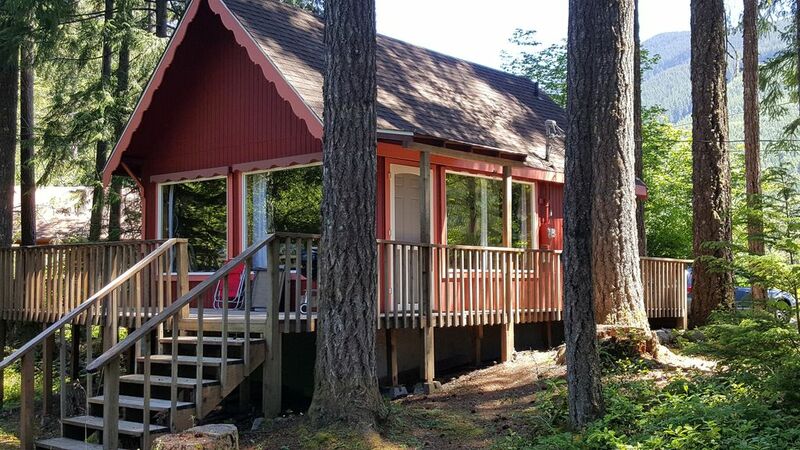 This cabin is cozy and charming; it has been recently updated inside, offers privacy and yet is close to many fun activities. Mt. Rainier is majestic and this area is stunning. Our little cabin allows you to get away from the rush of life and enjoy some time just resting at the cabin or enjoying the great outdoors. While sitting on the deck you can hear the birds singing and the river rolling by. Out front you may see Elk in the field across the road or simply just enjoy the surrounding beauty. Our cabin is located in Paradise Estates and is on a paved road. A nice sized three-quarter bath. You can see the creek from the back deck and most definitely can hear it throughout your stay. Big Skate Creek runs through the back yard. Electric heat as well as the wood stove. Yes, we have bath and dish towels. Yes, a microwave is on site. Fully stocked for 4 guests. Fully stocked kitchen with a 4 burner stove, a dorm sized refrigerator, a microwave, coffee bean grinder, coffee pot, electric tea pot and more. A large back deck area. There is a small lake in Paradise Estates with a communal swimming area. Check in is from 3:00 - 9:00 p.m. and check out is 11:00 a.m.
Little Red has great light and space for couples who want to read books, listen to the rain, and do some yoga. Thank you, Rachael; so glad to know that you enjoyed your stay and I appreciate the kind words! Very charming, cozy cabin in quiet neighborhood. The cabin was exactly as described - well appointed and cozy! The neighborhood is beautiful and very quiet - great for relaxing and walking our dogs. We slept on the futon, which is the most comfortable futon we've ever sat or slept on. We spent a lot of time on the deck enjoying the view and sounds of the forest and deer meandering through the yard. Thank you, Linda and Larry; I am so glad you enjoyed your stay! This is a Wonderful place built with a great deal of thought. This was a dream come true for us. We were able to have our two dogs at the mountain. Awww, thank you!! So glad that you enjoyed your stay! We enjoyed it immensely. We hiked, visited Mt. Ranier Park and just enjoyed Little Red's ambience. Thanks again for a great stay! Thank you; so glad to know you enjoyed your stay! Hope to see you again!! Nice little cabin close to Mt Rainier National Park. Quiet area. Perfect for a us as a couple with our dog. Thank you, Sarah! So glad you enjoyed your stay! Our little cabin is on the edge of the Gifford Pinchot National Forest, is 5 miles from Paradise Entrance of Mt. Rainier and just 90 minutes from Mt. St. Helens. Crystal Mountain Ski Resort is near by as well as many outdoor activities.